BinBooker.com was developed to help roll-off dumpster rental companies automate and organize their business. Increase sales, automate the ordering process and reduce phone calls with our online booking functionality. 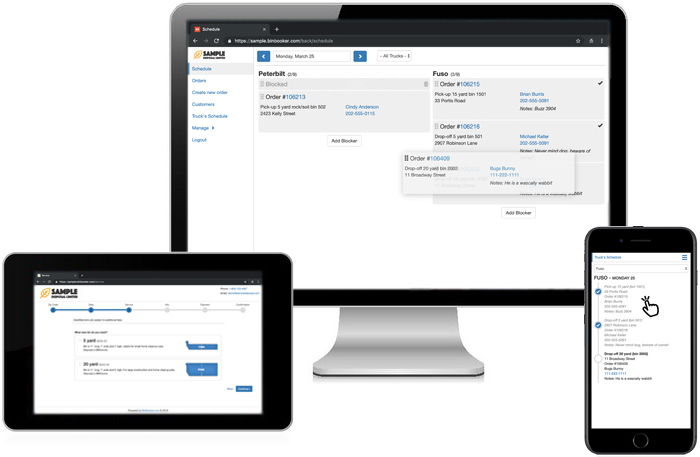 Stay organized with our integrated schedule, order and customer management system. BinBooker.com is trusted by dumpster rental companies across North America with 100% customer retention. Accept online orders and payments 24/7 from your existing website. Maximize profit by setting different prices for different zip/postal codes. Payments are processed, bins reserved, trucks scheduled and receipts e-mailed automatically. Your customers, orders and schedule all available at your fingertips. Create accounts for each of your staff, providing only the access that they need. Optimize the day's schedule by dragging-and-dropping appointments. "BinBooker saves us tons of time! We have virtually zero data entry. It has fully automated our bin booking." "If you're not already accepting online reservations I would highly recommend it!" "We are so glad we switched to BinBooker. We think this system is a competitive advantage for us in Fredericton." Below try the two demos for the imaginary company "Sample Disposal Limited" from Seattle. Click the button below to book a sample bin and see exactly what a customer would see when they order a bin online. Click the button below to see the secure administrator area, where you would manage your orders, schedule, pricing, staff and more. Click the frequently asked question below to reveal the answer. How can BinBooker.com help my roll-off dumpster rental business? Conversion. Your website gets multiple visits every day. Each of those visitors is a customer shopping around for a dumpster rental — and they are looking at your competitor's sites, too. Allowing online booking increases the odds of converting them into paying customers. Organization. 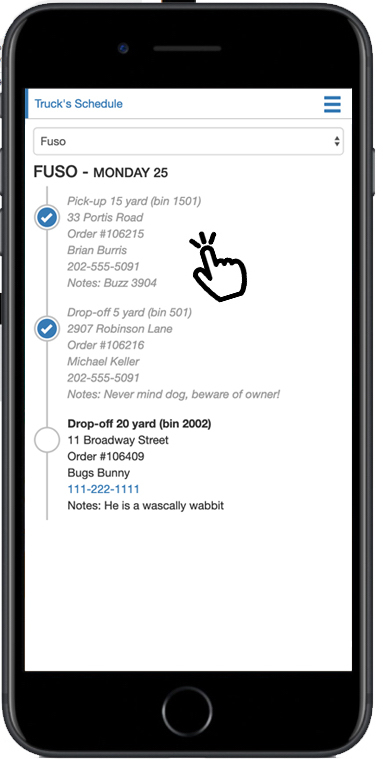 Your orders, customers and their order history, and schedule are all at your fingertips. Everything is in one place, accessible from anywhere with an internet connection — even from a mobile device. Automation. Receipts are automatically delivered, existing customer data does not need to be re-entered, and weight charges are easily added to credit cards on file. Your first month using BinBooker.com is free. Subsequent months the cost is $5 per order to a maximum of $50 per month (if you have one truck) or $100 (if you have multiple trucks). Merchant fees are applicable from Stripe.com. There are no contracts, sign-up fees, cancellation fees, or hidden costs. We want to build a long-term relationship, there are no surprises. Are we too small/too new? Our smallest customer has just five bins, our largest has hundreds. Whether you are a one-man operation, or you have multiple trucks, online booking can help you. BinBooker.com makes it possible for bin rental companies to offer online booking without spending tens of thousands of dollars on a custom website. The customer could still call you to place their order over the phone if that is their preferred method. Booking online is another option for them, for example late at night, or while your business is closed. We have seen nearly 33% of all orders being created online. After you recieve an order that was placed online, you would typically call the customer to confirm the order details and answer any questions they may have. Reach out to us to set up your free trial or to answer any questions.